The list of necessary items to get for the well-being of your new kitten. 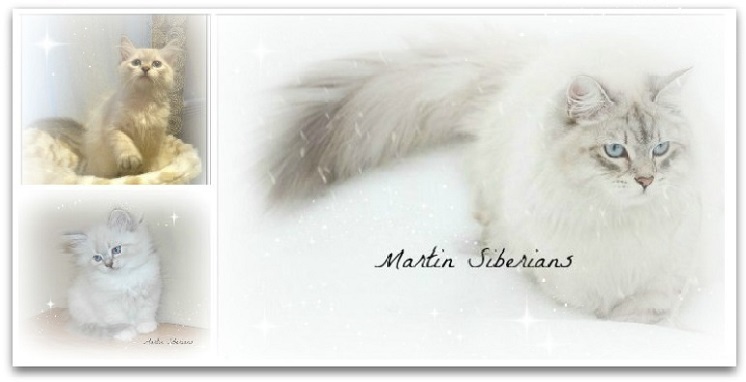 Below is the list of items we use at Chatterie Martin Siberians and which kittens are accustomed to. Ideally a tray without lid on the top since the cat scrapes the litter to bury his needs and in doing so, raises the dust. With a lid, the cat is subject to more dust in his lungs while this model allows him to breathe better. 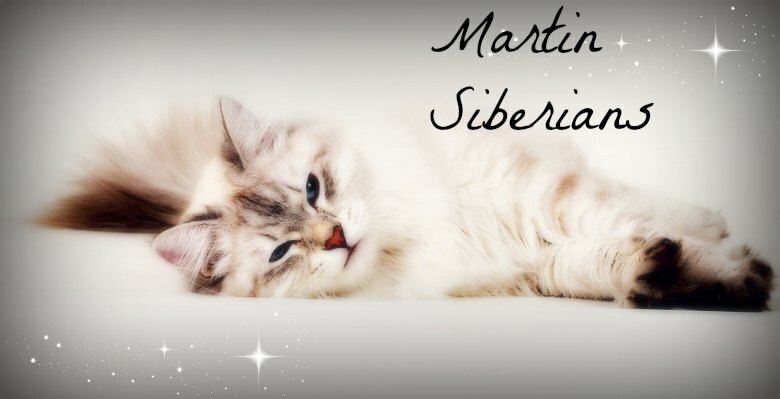 Also, note that this model is very large since the kitten will grow and the male in particular can become quite large, It must feel comfortable. I wash the litter thoroughly every week with a cleaner and a disinfectant. At this moment, I put a new litter back in the bin. This model is beige and huge, it was purchased at Pet shop Mondou. We have 7 of them and cats love it. Medium size since your kitten will grow, it must be clean before each use. 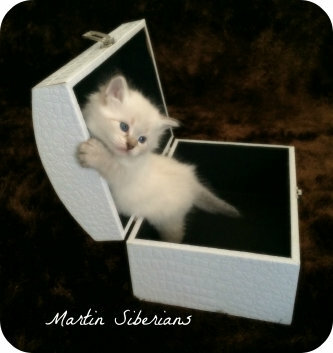 It is necessary to pick up your new kitten at the Cattery and mandatory! No kitten will leave in a cardboard box. You will need it for your visits to the vet. Easy to get in pet store. We use these fountain models in Cattery. Easy use and weekly maintenance. Our cats love these fountains. You can however use a simple bowl of water and change the water daily. Easy to get in pet store. The fountain is much more than a simple gadget for pet lovers: it offers several advantages over a simple bowl of water. Filtration: The filter of the device eliminates excess magnesium and calcium found in your water. It also eliminates bacteria, hair, dust and anything that could make the water disgusting. Freshness: The circulation system keeps the water fresh and oxygenated at all times. Many felines hate stagnant water, hence their interest to drink at the tap! Stimulation: The fountain produces visual and auditory stimulation that attracts your companion and may encourage him to drink more. Better Kidney Health: By encouraging the cat to drink more, it takes care of the kidneys and allows them to eliminate waste more easily. Storage Capacity: As it receives more water than a simple bowl, you will not need to fill it as often! It is therefore practical during short holidays, so that your companion does not miss anything. Easy to find in any pet store. The laxative paste is given at a frequency of 3 times a week in adult cats. It serves to prevent the formation of hairballs. This product is not recommended before 6 months of age. I like to use this trash to throw litter droppings everyday. It is located right next to the litter box. It blocks bad smells and prevents me from having to wear everything outside the house..
Our cats generally like to relax on the cat tree. The favorite section on a cat tree is often the hammock, so I advise you to choose a tree with hammock. The model I use was purchased at pet shop Mondou and satisfied all my cats. They take the opportunity to make their claws on the poles dressed with sisal rope! I even hung a ball of feathers under one of the tablets and they can enjoy it to play. 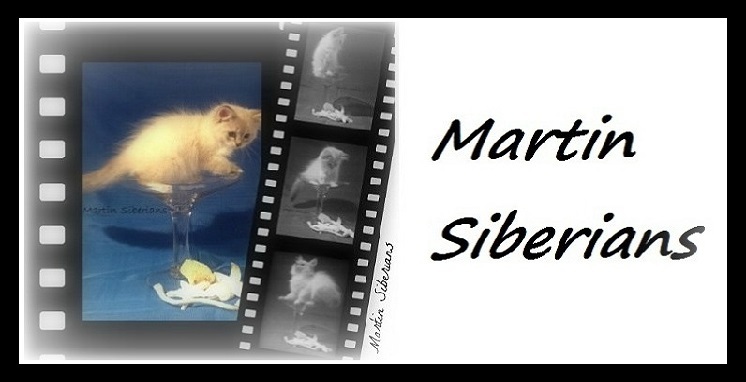 Kittens tend to eat litter beans, so it is important in the early days to offer only absorbent and unscented litter. When they are older, the bag of clumping litter will be even better since the urine is easier to clear with a clumping litter. I buy kitty litter at pet store Mondou and adult bedding at Costco. I finally allow myself to remember that some plants may be toxic to your new pet ... so it is important to do some research to validate if the plants you have could be harmful and in the uncertainty it would be ideal to get rid of it ... same thing for some foods, among others, grapes and other pips or nuts, nuts, garlic and onions, potatoes, cabbages, turnips, mushrooms, avocados, coffees and teas, chocolates, meats and raw fish, cheese and milk are toxic to cats ... giving the leftovers of his meal or some pieces of the dinner that we are preparing can seriously damage their health or even cause death. Alcohol, tobacco and marijuana could also poison the animal and cause his death !!! Kittens or cats can sometimes have diarrhea due to various factors such as a move, a new member in the family, intense stress, a change of food, intestinal worms, etc. etc. Please take the time to validate that your kitten is still fed with this food before buying your pet bag by sending me a brief email. The food brand that we usually use to feed our kittens is ''FROMM'', which is easy to find in pet stores. At Cattery, we do not restrict our animals and food is available 24 hours a day. Ideally, the food should be given every day since too much in the open air for more than 48 hours will lose its properties and may even cause diarrhea. When it comes time to buy food, take care not to go wrong, it is essential for the health of the kitten .... all the bags are visually similar. As you can see in the picture, the bag of FROMM is grain free. There is different savor but the savor the kitten is fed with is '' Hasen Duckenpfeffer''. This is a German-inspired, grain free entree prepared with rabbit and duck. The same food must be given during the first year since the kittens are used to these kibbles and they have no diarrhea. By changing model or brand, the kitten is likely to have diarrhea, which must be avoided at all costs. The only acceptable reason for changing food would be a sudden intolerance, which is likely. Or, on the order of the veterinarian for any problem. Cats usually love pate in sauce (cane) ... always check the quality of the ingredients is essential. The male, in particular, is in great need of pies in sauce since they contain a good amount of water. The male will avoid problems such as stones on the kidneys since it will remain well hydrated. I like to buy, among others, the brand Fancy Feast Hors d'oeuvre since I can see through the packaging and find that it is indeed real meat. I buy it at Walmart. Always check the expiry dates. My cats, both males and females, love it. Never, never, never give a rest of table or milk. As treats, it is acceptable to buy health treats in pet shops. Do not overdo it, once a week is ideal. I especially like giving them anti-scalp treats.